Danny Brown makes a big change in his appearance. Danny Brown fans are well acquainted with his experimental, feverish music, his wild and brilliant lyrics, and his outlandish persona, but one of the rapper's most recognizable traits was his gap-tooth smile. Well, it would appear that the days of Danny's hockey player swag have come to an end. While the fate of Danny Brown's teeth has previously been the subject of a few false rumors, it would appear that the Atrocity Exhibition rapper has officially taken the plunge and went to get his teeth fixed. 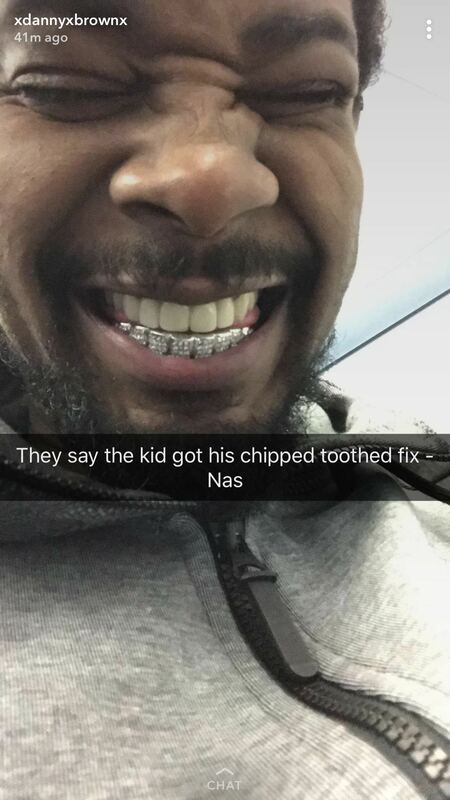 In a recently caught snap from Danny Brown's Snapchat, the rapper can be seen sporting a brand new smile, along with some notable lyrics from Nas - "they say the kid got his chipped tooth fixed." As stated earlier, Danny's teeth have been falsely reported fixed before. In one particularly insane rumor, it was speculated that KFC paid for the damage after the rapper was hit by the car in one of the restaurant chain's parking lot. However, that rumor turned out to be false, and Danny quickly confirmed the fact that no, his teeth were not funded by the Colonel. Now, however, appears to be a different story. Along with the Snapchat photo evidence, Danny has retweeted the above picture, along with the famous Ozzy Osbourne lyric "I'm going through changes." He also retweeted another user who marveled at the current state of Danny's new grin. It may seem like a silly thing, but Danny Brown is one of the game's most underrated emcee, and his signature smile was one of his most iconic features. It's cool to see him take the plunge and make such a drastic change, especially if it brings him some happiness and a new wave of confidence. So, props to Danny Brown for doing something for himself.